Genres: Mecha / Supernatural / Sexual? 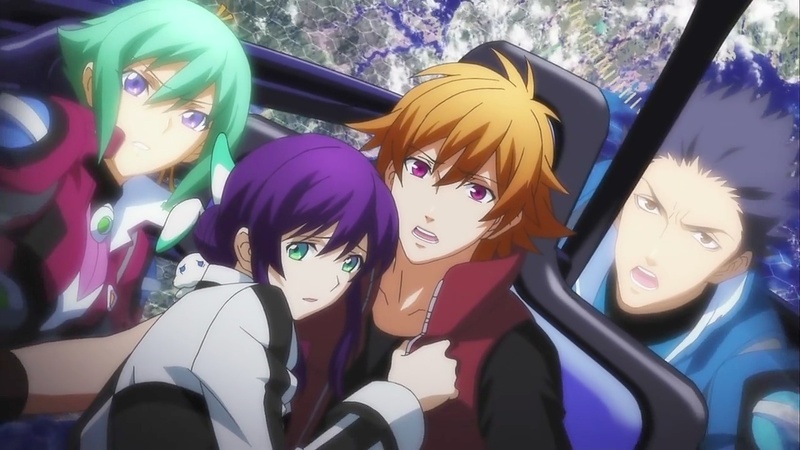 Summary: Another story about people piloting Aquarion robot combating enemies from another dimension. Personal comments: Half way through episode one, I remembered why I stopped watching the first series: people piloting robots, powered by orgasms. While this one is not quite there yet, I can sense it's definitely heading that way. On top of that, I don't quite understand mecha animes in general. When I hear people talk about mecha anime, it's always like "oh have you seen the part where the mecha did ... and ..., man that was awesome fight." But it's not like it actually has much to do with the person piloting it. The superiority of mecha fighting always comes down to either the supernatural power the pilot possesses or the better technology the mecha possesses. Neither of them has anything to do with the battle itself and outcome would be more or less predetermined by those two factors ahead of time. So basically most mecha animes that spend much time on mecha battles always end up being either the quest to gain the supernatural power or the quest to obtain the superior technology. How does someone find it amusing over and over? That's beyond my comprehension. I can give you a small explanation of why i enjoy mecha so much. first, technology was always something interesting for me, mecha is just part of that branch. I'm a sucker for big robots with huge lasers or whatever weapons you can think. Second, what i like in most mecha series is probably that they create some kind of setting where mecha is normal but then put in some mecha that has absolute more power then other types. Combined that with the fact they are constantly blowing up enemies is something for me to enjoy. I have to say when i watch mecha, i don't watch for the story (most of the time) i just watch for the explosions and whatever enormous weapons they can make to kill each other. For your first point, imaginary technology that purely created for the sake of mecha advancement doesn't interest me. If it were some technology that I could remotely relate to, I'd much more likely to be willing see what the story has to offer. But technology are groundless has no real world use other than mecha fighting just seems dumb. That's why I was so very critical about IS when they somehow decide the technology that doesn't seem to have much practical use other than creating a ultimate exoskeleton fighting champion fight is the hottest thing since sliced bread. For the second point, I don't find over-sized metal on metal action amusing. All they do is to have the pilot sit stationary and pulling some lever and pushing some paddles and scream as if it'll help his mecha punch harder or fly faster. For what they do inside, I don't even see the need for the pilot to be in the mecha. If they just set up some remote control mechanism for it, their mecha would just operated as well, because surely, with all that imaginary technology advancement on mecha, it'd be trivial to come up with such simple technology to protect pilot's life. So there's no point for anybody to risk their life to do anything mecha related battle. At that point, conflict between two nations becomes a video game where each will control a set of robots remotely to rake havoc on each other's land. ICBM would be much cheaper and more efficient for that purpose. So to me, logically, mecha anime doesn't make sense, yet all mecha animes about mecha are so very dead serious about their mechas. For that reason, I watch mecha series that doesn't take themselves seriously (like Star Driver), or series doesn't try to explore the reasons behind mecha technology and its advancement and use mecha for utility purpose (like Macross), or series that actually make sense why someone would risk their lives to actually pilot the mecha instead of remotely control them (like Broken Blade), but would not watch mecha series that dead serious about massively impressive and complicated mecha technology yet they practically don't use it for anything else other than fighting and can't come up with simple technologies that would let pilot remotely operate them instead of having to risk their lives inside. Well. take the words right out of my mouth. As soon as you said "how does someone find it amusing over and over" I figured I'd try to come and buffer against the obvious answers, but you already had to anyway. The basic concept is "I want to see big guns blowing big things up" or such. Which, is probably the driving principle behind the Mobile Suit thing: It's just a really big gun where you have to sit on the trigger instead of pulling it with your finger. Really the only mech anime I ever cared about was Gundam, and that was only ever two specific story arc's out of the whole set, the arc with the Wing Gundam & Wing Gundam Zero mechs in them, (which always registers in my brain as the 'original' gundam story even though I know it's not), and the Gundam arc where the Gundams are precisely what your comment said, "a ultimate exoskeleton fighting champion" with a tournament being the cover story. I should track down which one that was, I'd like to get it. It actually had a interesting plot to it as well as a decent reason for them to actually be inside the walking metal death traps. Each nation had it's own champion + Mech etc. Found it. Mobile Fighter G Gundam is the story arc, and hey, low and behold no wonder it has some sense worked into it, it was actually set apart from the original story arc in its own little universe according to this wikipedia article. I see your point, I too like to see things blow up from time to time for no reason. But there's a limit how many of them in a row I can withstand. If Michael Bay makes a two hour long movie, I'd probably watch it because I too enjoy big explosions. But if Michael Bay to make a TV series, I'd probably never gonna waste my time on it because it's going to be the same explosion over and over again over much loner time span. So same analogy would apply to mecha series. I'm probably willing to watch a gundam-ish movie, but would feel an entire tv series of it is just waste of time. That's my feelings on the Mech stuff exactly. After watching those two story arcs in Gundam, I never really cared that much about the other mech anime's I watched. Evangelion was interesting but I never did watch all of the episodes, the psychology thing was the part I was most interested in, so it partially doesn't count anyway. After a quick batch of googling, I found the only non-gundam mech anime I ever really put alot of my attention on, Eureka 7. Probably due to the decent character development and non-mech-oriented story plot.